Location: Western Orleans County, Route 31, Village Of Medina. Parking is available at State Street Park located on the corner of State Street and East Center Street. Another small parking area is located on the western side of the Erie Canal. From the parking area in State Street Park, walk up a small hill, and across the Horan Road Bridge, which crosses the Erie Canal. After crossing the bridge, turn left (south), going down a slight hill to the canal tow path on the bank of the canal, and turn right (west). Follow along the railing, and in a very short distance you will see Medina Falls to your right (north). Medina Falls is 40 feet high, and has a curving crest that is 150 feet wide. The falls faces to the west, and has developed in a purpleish-red colored sandstone known as Medina Sandstone. 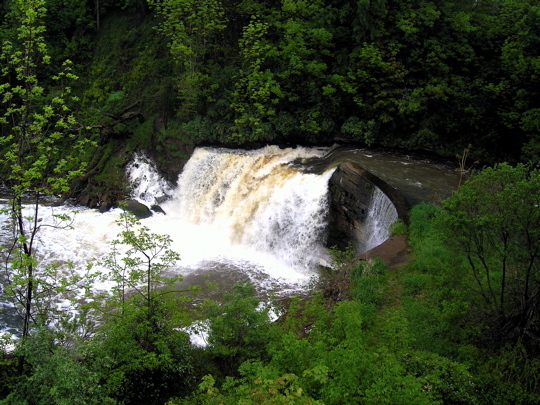 The crest of the falls was capped by a concrete dam probably in the very early 1900s. The creek has broken through the eastern end of the dam. In times of high water the creek falls vertically over the entire width of the dam. In times of low water the creek flows through the break in the dam, and drops vertically about 35 feet. 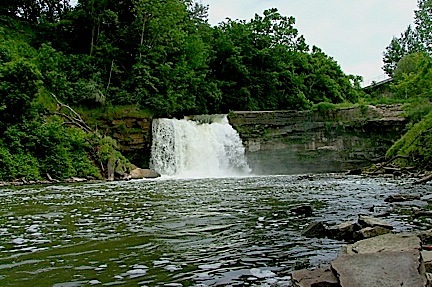 The falls is located a little over 2 miles north of the crest of the Niagara Escarpment. The falls is found on Oak Orchard Creek, which originates in the Oak Orchard Swamp, in the Iroquois National Wildlife Refuge, some 12 miles to the south of the village. The creek flows through the village from south to north, and passes under the Erie Canal. The massive aqueduct that carries the canal over Oak Orchard Creek was built around 1913, and replaced an even older one. The tow path on top of the aqueduct is about 42 feet above the crest of the falls. The western flank of the falls has been the sight of numerous mills dating back to 1817 and possibly earlier. The A. L. Swett Electric Light and Power Company was the last business to occupy the sight. It used the water power of the creek to produce electricity for more than 50 years, the building being torn down in the late 1950s. For a 1890 view of the falls go to Medina Falls on the Erie Canal. Medina Falls from the creek bank. Photo © by Bob Ensminger. 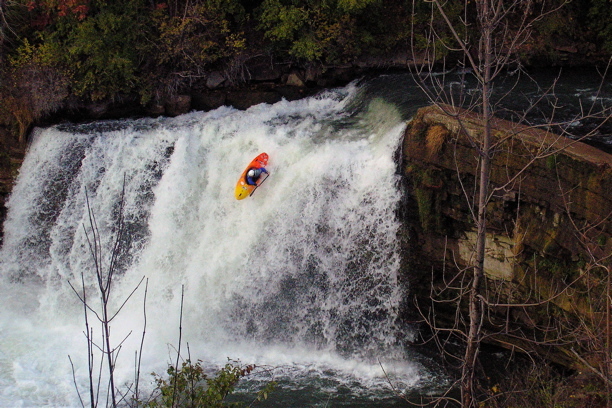 Danny Doran over Medina Falls -- November 10, 2007. Photo © by Falzguy. Located east of the Village of Medina is a culvert, or tunnel, that allows you to drive under the Erie Canal, the only such place on the entire length of the 340 mile long canal. To reach the culvert, leave State Street Park, and travel east on Route 31 for about 2 miles to Culvert Road, and turn left (north). You will reach the culvert in about 0.5 of a mile. It was first built in 1823, being rebuilt at least twice, when the canal was widened and deepened in 1854 and 1913.